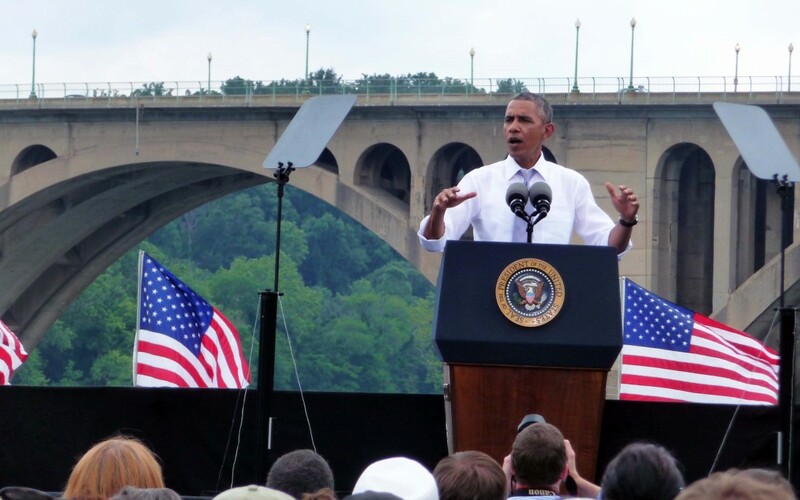 President Barack Obama held a rally today at the Key Bridge in Washington, D.C., just blocks from ARTBA headquarters to highlight the Highway Trust Fund (HTF) financial crisis. The President warned that nearly 700,000 people could be out of jobs next year without congressional action. Also at the event was U.S Secretary of Transportation Anthony Foxx, who earlier in the day sent letters to state transportation departments and transit agencies outlining steps the U.S. DOT will soon be forced to take to manage the impending insolvency of the HTF. U.S. DOT’s most recent projections show the shortfall will reach a critical point in the trust fund’s highway account in just a few weeks, requiring the agency to institute cash management procedures for highways, with a similar cash management plan to follow for the mass transit account when it is expected to reach a similar point this fall. U.S. DOT’s approach is intended to allow state transportation departments to direct available cash to what they determine to be the highest priorities and choose which projects receive reimbursement. Senate Finance Committee leaders and staff are working on a short-term revenue package that would keep the trust fund afloat through December, providing Congress with more time to produce a long-term, sustainable funding solution, potentially after the November elections.